The other day, Matt Jabs asked if you should invest while you’re in debt. This is an interesting question, and one I thought worthy of tackling myself. For starters, you probably shouldn’t be investing while in debt unless you can reasonably expect to outperform the interest rates that you’re paying. In other words, if you’re carrying high interest consumer debt, you should focus on getting out of debt instead of building your portfolio. Of course, this is a bit of an oversimplification. On the one hand, it ignores important things like building at least a minimal emergency fund. On the other hand, it ignores things like the free money that comes from employer matches on your retirement contributions. Another consideration relates to contribution limits… There are annual limits on how much you can contribute to things like IRAs, and if you skip a year, you can’t go back and make it up. Would I pump money into an IRA instead of paying of credit card debt at 20%? No, but these sorts of things are still worth keeping in mind, especially when thing . Here’s a thumbnail sketch of how I’d approach things. Note that for the first step, I’m assuming that you have enough to cover all of your minimum payments plus make the 401(k) investment. If not, you should obviously focus on your debts. There’s certainly no harm in carrying a mortgage while building up your nest egg. In fact, if you wait until you’ve killed off your mortgage, you’ll find yourself in a huge hole by the time you turn your attention to the future. Not only will you be way behind the curve at this point, but you’ll also have missed out those IRA contributions that I warned you about earlier. Anyway, enough about my view… What do you think? Investing money while in debt doesn’t make sense in many cases. Aside from the fact that the interest earned might not be as high as the amount you’re paying for your debts, there’s also risks involved in it. Those premiums sound really high for a 29 year old. As a healthy 26 year-old I’m paying $175 per year for a $500,000 15-year term policy. I would look into making sure you are getting a decent deal. I bought a 15 year policy, but I wish I instead bought an Annual Renewable Term policy. The price starts out slightly lower than a 10 year term policy and rises very slowly. You can never be dropped because you are unhealthy. This lets you save money when you are younger so you have more to invest. You don’t have to worry about the policy ending at some fixed date when you still might need it. But you also aren’t pre-paying as you are in a 30-year term product, for coverage you might not end up needing for that entire term. BG: I understand now the point you didn’t want us to miss. Thank you. The subject of this thread is not whether or not to jump into a mortgage for the tax benefits. I already have the mortgage. I already itemize my deductions because I am comfortably over $11,400- before adding in mortgage interest. The theoretical best place to put my money would be different if I was closer to the deduction threshold. When we compare investing to paying off a mortgage, we must consider the $11,400 mark in conjunction to the risk associate with debt and personal risk tolerance. BG: I’m not surprised that mortgage broker pamphlets present a slanted view. I’m simply saying that people need to look closely at their own situation, as the truth may well lie somewhere in between the extremes. Nowhere in there does he mention “standard deduction” or “itemized deductions”, or even hint that you need other deductions to offset the SD to be able to make these bold claims — he simply makes the blanket statement that 100% of mortgage interest is deductible, which is pure BS. BG: I think everyone needs to evaluate this for themselves, as there is no one “right” answer. As for me, I have an incredibly stable job (you’ll just have to take me at my word on that one) and we thus view taxes as charitable contributions as “fixed” expenses. Other people might disagree, particularly give their circumstances. This is not to say that I’m against paying off the mortgage early — in fact, we’re working toward that — but rather to say that there are many moving parts, and your blanket statement reagarding the deductibility of mortgage payments is no more correct for “everyman” than a blanket statement the other way around. Your point about flipping things around is a good one, though. People need to be careful not to continually shift the argument around to justify their decisions. #32 Nickel) I know what you are saying, and that is the same thing that Chris, or a realtor, or a financial adviser would say as well. If you are going to state that mortgage interest is fully deductible, then you need to state, in the same sentence, that taxes and charitable contributions are NOT deductible, and that you need to have $11,400 (married) in these other items for mortgage interest to be considered “fully” deductible. Stating it this way would expose the game that realtors (or other biased people) play to make it seem that carrying mortgage interest is better than it really is. I don’t think anything is “on top”, and each dollar is weighted equally as the tax code says it is. Mortgage interest does not have special treatment on tax forms, it is just yet another item in a list of allowed itemized deductions that are all counted equally. You are sacrificing the deduct-ability of taxes and charitable contributions to make mortgage interest look better than it really is. I wonder if you’d flip-flop on a different topic, and sacrifice the deduct-ability of mortgage interest to make charitable contributions look better than it really is…? BG: While they are all equally deductible, many take it as a given that they will be incurring those expenditures. Thus, in a practical (if not technical) sense, the mortgage interest is added on top of those, and is largely (if not entirely) deductible. 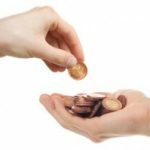 #30) I could never attribute 0% to taxes and charity as you seem to do. The truth is that taxes, charitable contributions, and mortgage interest are ALL EQUALLY deductible. You are missing the “equally” part. The ever-changing standard deduction (SD) number doesn’t even come into the equation until ALL deductions are itemized and summed up first. Once the list is summed up, you can’t then say that 100% of the amount over the SD is from interest. Each item in the list equally contributes to the dollar amount below $11.4k, as well as the dollar amount over $11.4k (if any). The “proof” is: if you get laid-off and you don’t make any charitable contributions for a year, your itemized deduction amount will drastically change: even though you still paid the exact same amount in interest. How can you weight something at 0%, and yet it can make a drastic impact? I’m really tying but I’m just not following your argument. In your example, I am paying 5k in taxes and 6k to charity. I would expect these amounts to remain the same each year unless my income drops. Now whether my mortgage interest paid is 1k or 10k, I can deduct all of it because I am already over the standard deduction (rounding out the $400). I assume you’re referring to private loans? I just consolidated my (4-figure) Direct Loans in July at a fixed rate of 1.75% and you can bet I won’t be paying them off one second early. You can only deduct the amount over $11,400, so you are only deducting $7,600 out of the $19k total, which you can’t claim is ALL from mortgage interest, because you are ignoring the other items. In my mind, the true amount deducted is 40% of each of the items (40% of $19k is $7.6k) — you are only deducting $3,200 (40%) of the mortgage interest. I agree, everyone’s situation is different for taxes, but nobody can ever deduct the mortgage interest FULLY. If someone is telling you that, then they probably are biased: either a realtor, or a financial adviser. Also, keep in mind that as you pay a mortgage off, you will have less and less interest to deduct (as well as an ever increasing standard deduction), so it is worthwhile to perform these calculations every year to know the tax consequences of your “investments”. I totally agree on paying off (non-mortgage) debt. Investing is never certain and could produce a loss, as we should understand well over the past 10 years. Paying off debt is a guaranteed return. Not to mention the return from better sleep at night. For a long time, I invested instead of paying debt because I thought (wrongly) that I could get a higher return on my investment than my credit card rates. It took about a year to realize my folly, but since then there is no doubt in my mind that I should pay off debt first and only then think about investing. #17) I find it interesting how you view your deduction only as anything over the standard deduction. In my situation I will always choose itemized deductions because of charitable contributions. If your close to threshold of std deductions then by all means pay down that mortgage. Everyone’s situation is very unique. @Ferne: I believe “Dad #18” was being facetious and was eluding to the fact that it is makes much more sense to give that amount to your church than to the fed. I think it all comes down to the return on capital. If invested capital will produce more income than interest payed down, then you invest. However, the stock market is unpredictable and even with many undervalued stocks, if the debt interest rate is over 10%, I would pay it down first. Hey Comment by Dad – Sept 25, 2009….is that some kind of joke about giving it to your church?????? I believe you should knock out the debt first. Interest deduction from your house is a losing proposition. You get just as much by saving that money by paying off your house and donating the interest amount to you church! Wouldn’t you rather your church have it then the federal government? haha! #12) I doubt people can FULLY deduct the mortgage interest. I have a $130k mortgage balance and I am only able to deduct a few hundred worth of interest. You can only deduct the interest OVER the standard deduction: which is $11,400 for “married filing jointly” in 2009. In 2010, I suspect I won’t even be able to itemize at all. So what you said is easily proven false. I would recommend you get Whole Life for $100 more a month. Over time once the equity in your Cash value becomes liquid. Meaning you can borrow from it. So just like the 401K, you can take a loan from yourself and pay yourself back. Of course this also depends on the terms of your policy. I think you should invest a little for retirement whilst you’re getting out of debt – it’s a good habit to get into, and it’s easier to increase the amount you contribute than to open a new account. But then, I’m lazy – YMMV. No one strategy works unless you are certain of the returns. You can’t guarantee stock returns but you can guarantee the savings on not paying 20% CC interest. Build an EF with small contributions as you pay debt and increase it when debt is gone. Put in at least as much as the employer match to get the free 401K money. Paying mortgage debt over saving for retirement will net you a negative return over 10 years. What about life insurance? I am 29 and just leaving the military where I was covered under the SGLI and now that I have my new job I have the hard decision of picking out a life insurance plan to cover my family should the unexpected happen. Should I go with whole life or term? The difference is $100 a month between a 30 year term vs a whole life policy but at $265 a month for whole life that is equal to my car payment and almost what I need to invest each month to max out my Roth IRA account for the year. Any suggestions on what makes the most financial sense for someone who is 29 years old? The only debt I carry is one car payment and a mortgage, which is locked in at 30 years at 4.5%. Most people can fully deduct mortgage interest paid. In this case your investments only have to surpass your mortgage rate, without having to account for taxes paid on the earnings. Hank) You get the exact same compounding you speak of when paying off debt too. Time is the best thing young investors have on their side. 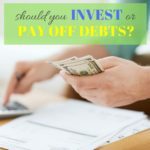 I personaly could not bring myself to the point of not investing while paying off debt when I was younger because I did not want to loose a lot of that compounding interest. The next time you run an invest vs. debt post, any chance we can get you to throw some actual numbers in there? What can we “reasonably” expect the stock market to return? And what kind of high-interest consumer debt *isn’t* deductible? The only high-interest debt that I can think of that is deductible are some types of private student loans, but I don’t consider that to be consumer debt. Speaking of student loans, I’d like to see you run a post with real numbers discussing whether one should be investing while he has student loan debt. If he has enough money to pay more than what is required, should he pay down the loans early, or should he invest for retirement? This becomes a difficult question to answer, as student loan interest rates are generally higher than those on a mortgage, but they typically carry longer amortization periods than traditional consumer debt. Should one wait until his/her loans are paid off before investing full-bore into retirement accounts? Should one take the money he would have invested, pay off the loans early, and then invest all of the money used to pay off the loan? Paying the mortgage early results in tax-free gains, that are compounded on the _guaranteed_ rate of your mortgage. Matt’s mortgage is at 5.625%, so any extra money “invested” in paying it off early grows and compounds at 5.625% (guaranteed and tax-free). Compare that with the non-guaranteed 9% (20-year average) that you can get in index funds and you are looking at an after tax growth of 6.48% in the index funds (not even 1% better than paying off the mortgage). My advice is to always pay the mortgage first before investing in a taxable / non-retirement account. Do use the 401k (or Roth-401k) if there is a company match. Use the Roth-IRAs if you qualify. I love how you covered the 401(k) match issue. I think most pundits are quick to dismiss that incredible benefit and just focus on debt repayment. Among other things, a lot of people who intend to pay off debt, don’t. If they put off investing until they have paid off the debt, they’ll never do it. I dont usually comment on blogs, but this was great! I was wondering this myself and I really appreciate the advice. I’m very glad you post this article today. I’m a firm believer in listening to people who are already “where I want to be” – financially or otherwise. Not surprisingly your advice is rock solid and will more than likely be the skeleton that I start from and build upon. I am not in debt so the situation isn’t for me, but I have to believe focusing on one important goal and getting rid of any debt should be priority #1. I don’t mean mortgage debt, but credit card, student loan, etc, should be main priority. I’ve cut the 401k contributions temporarily. I was able to keep them for awhile, but when I quit the second job, I suspended them for now. Before I did that, I ran some calculations on the impact that it would have for my retirement nest egg. Shouldn’t be too bad as I’m only planning on doing it for a few more months. I just started the job I’m in last Dec. So, I’m hoping that when bonuses roll around in March, I can use it to pay off the credit card and restart the 401k. In the meantime, I’ve managed to cut about $150/month from my budget and I’m using that to rebuild the emergency fund, which got wiped out last year. Thanks to Nickel, I found CashCrate and I’m able to earn a little bit of spending cash so I don’t go completely nuts. thanks for the post. i have been wondering about this lately. i do get a matching contribution for my 401k at work and was giving 5%. i am so broke at this point that i decided to cut that down for a temporary reprieve to get another $100 in my paycheck ONLY to send to my credit cards. i started on this quest to be credit card debt free about a month ago. after working through the feelings of desperation and beating myself up for being so fast with the credit cards—i am just accepting my mission. i have a new attitude and feel pretty good. i have turned my new quest into a game of how little i can spend. thanks for the motivation and information!